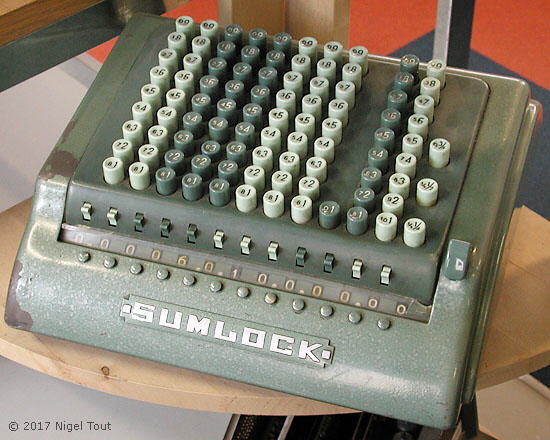 Sumlock 912/F Sterling Currency Calculator with Farthings keys. SUMLOCK model 912/F Sterling currency "Comptometer" with Farthings keys. This is a full-keyboard direct action calculator of the "comptometer" type for Sterling currency calculations. It is similar to the 912/S machine except that it gains three farthing (1/4 penny) keys on the right by losing a column of pound keys on the left. Manufactured about the 1950's to early 1960's . This machine was photographed at the computing museum at Bletchley Park, England, but items on display vary. The farthing ceased being legal tender in Britain in the early 1960s.